50 residents at RW 08, Halim Perdanakusuma Urban Village, Makasar, East Jakarta participate in fire handling training on Thursday (9/6). They learn about fire hazards and practice to extinguish fire.
" This training is given to assist residents in conducting early fire prevention"
"This training is given to assist residents in conducting early fire prevention. 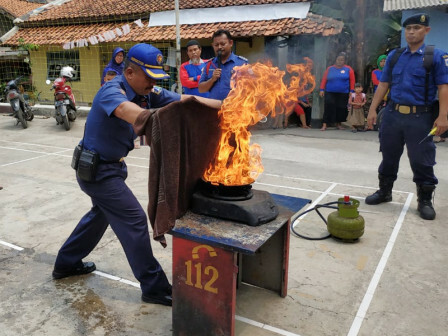 This way, residents can prevent fire to spread further," said Muchtar Zakaria, Acting East Jakarta Fire Handling and Rescue (Gulkarmat) Sub-dept. Head (Plt). He explained, participants are from RT/RW administrators, FKDM, Jumantik, and PKK cadres. His side hopes participants could educate other residents about this training thus more people would know about fire handling and prevention. Meanwhile, Linda (36) one of participants expressed her gratitude for having a chance to learn about fire handling considering she is a housewife who use gas stove in kitchen everyday. From this training, she will be more aware in using gas stove. "Because of this training, we be come more aware and careful in using stove thus fire incident can be avoided," she conveyed.